It's a dealer car. They are looking for $57,500. What year did Chevy start drilling and tapping the cylinder hears for mounting the alternator, etc? Was it 68 or 69? What I thought. So later than 68 model heads. I've got(not sure I still have it) one of those, not worth the paper it's printed on. Not sure why you would say that. Certification by Jerry is HIGHLY revered in the Camaro world. However, as been stated MANY times in the past, you can't please all the people all the time. That certificate 'cover sheet' (as we've discussed here many times) says *nothing* about discrepancies found, original parts on the car (IF ANY), or condition of the car! I suspect that is what the poster was saying. 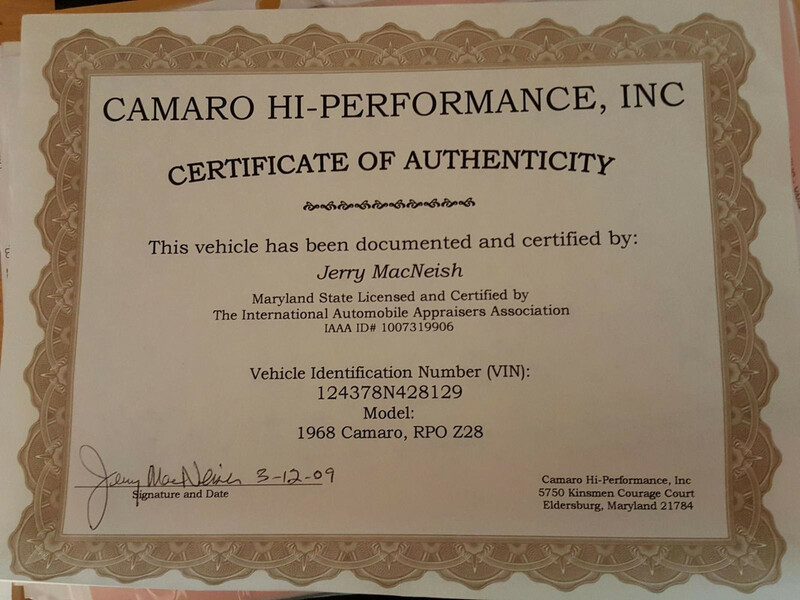 The page posted (the certificate/cover page) actually only says that the owner paid Jerry to check their Camaro and provides the VIN. Without the accompanying *details* on the car, the 'certificate' itself is just a 'brag sheet' among people who don't know the details! Agreed, the cover page really doesn't tell you a lot (although it DOES confirm the car left the factory as a Z28), so always ask for the FULL REPORT before buying a car. Just because it may have left the factory as a Z, doesn't mean it has ANY of the original parts anymore!! I just removed a bunch of posts. It was not relevant to the topic and just rehashed an old topic. Here is another example to compare to the one above for authenticity......to me both look genuine Jerry. Interesting comments in that auction. Motor Man chimed in and took a shot at Macneish with the old evening orchid debate. Seller never responds to questions on BaT but answers some in private messages. Seller is asked to supply the rest of the Macneish report and claims he only paid $500 for just the certificate front page because a full report was $1800 and not worth it due to CE engine. Ended up a reserve not met no sale at $37,250.